When you drop off your child at Songadeewin, you’re leaving them in capable hands. Each of our staff members has been carefully selected for both their skill set and their ability to serve as a wonderful role model who will inspire self-reliance, personal initiative, and fairness in every camper. Ellen Flight, the Director of Songadeewin, has been a member of the Keewaydin family since 1958. Ellen spent nine summers at Songadeewin on Lake Willoughby, first as a camper and then as a staff woman. In 1977, she joined the Keewaydin staff on Lake Dunmore, and in 1989 she became director of the Annwi wigwam, working with eight-to-ten year old boys. She has been the Songadeewin director since the camp opened on Lake Dunmore in 1999. An educator by profession, Ellen holds a BA from Skidmore College and an M. Ed. Degree from Lesley University. She taught seventh and eighth grade in Washington, D.C. and Dover, Massachusetts, for fifteen years, and continues her commitment to children’s education and development as director of Songadeewin. She is actively involved as a volunteer with the American Camp Association (ACA) both as an accreditation Visitor and Visitor Instructor. In addition, she has served the ACA New England chapter as a Board member, as a faculty of the New Camp Directors Workshop, and as a member of the legislative committee. 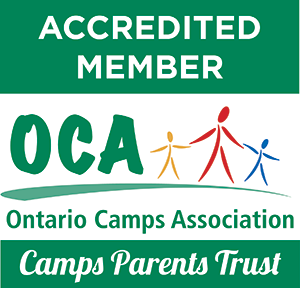 With a staff-to-camper ratio of 1:3, your child will be surrounded by trained adults whose role is to ensure they have a happy, well-rounded summer. This preparation starts well before the opening day with a week-long orientation focused on the needs of our upcoming class of campers. During this time, outside experts in the fields of psychology, education work alongside our expert Leadership Team and experienced staff to ensure that every counselor starts every season with the highest possible level of expertise. In addition, all new staff attend Trip School, a weeklong training in the art of Keewaydin and Songadeewin-style wilderness “tripping” that covers all the safety bases. Songadeewin staff also hold certifications in Wilderness First Aid, CPR and Small Craft Safety. Many staff are also certified lifeguards. Safety is the number one concern of every Songadeewin staff member, and almost a century of camping experience has taught us the risks to watch out for. While we pride ourselves on gently pushing each camper outside her own individual comfort zone, this is always a thoughtful process in which possible risks are carefully controlled and managed by staff members who have been thoroughly trained to understand them. We are especially vigilant on wilderness trips and on the waterfront. Each camper must pass safety tests in swimming and canoeing before participating in these activities. In addition to systematic staff safety and first-aid training, Songadeewin maintains a consulting physician, resident nurses, and a fully-equipped health center. A hospital and emergency room are located just 15 minutes away in Middlebury. Parents will also be glad to know we have hot showers, modern plumbing, and state-tested water from our private well!